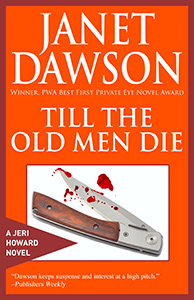 The past plays a major role in Jeri’s second case, Till The Old Men Die. A Filipino-American professor at California State University in Hayward has been murdered, his body found by Jeri’s father, a colleague. Now, several months after the funeral, a mystery woman shows up, claiming to be the dead man’s widow. The woman with the scar on her chin had costumed herself for the role of a widow. Her wardrobe included a black silk dress, stylish and expensive, accented by a circular gold brooch and a chic little hat with a veil, anchored to her smooth black chignon by a wicked-looking hatpin. A wide gold band adorned the third finger of her left hand. The manicured fingers of her right hand clutched a single sheet of paper. Unfortunately for her, she had failed the audition. That’s why her brown eyes glared beneath the plucked brows and jade eye shadow, and her full lips, sleek with coral lipstick, twisted with anger. That’s why, on this warm Monday morning in May, she stood in the middle of the History Department office of California State University at Hayward, swearing at my father and Dr. Isabel Kovaleski in a mixture of Tagalog and English. I don’t understand Tagalog, but the venom behind the words was unmistakable. As for the English, I hadn’t heard language that colorful since the last time I visited the Alameda County Jail. The woman’s tirade cut through class-break chatter and caused heads to turn in the corridor, where I stood next to the bulletin board. Professors in nearby offices appeared in their doorways, looking for the source of the racket. I fingered a notice about spring quarter finals and watched the drama in the office, mentally taking notes. She was Filipina, her English good but accented, her voice throaty, almost guttural. Height five three, I guessed, weight about one ten, and I put her age as mid- to late thirties. I had noticed the scar right away, a thread of white along her left jawline, perhaps three or four inches long. It could have been caused by any number of things but my first thought was that someone had struck her. Otherwise she looked prosperous and well-kept, with a certain hard-eyed, calculating edge, and a high-handed attitude that told me she was used to getting her own way. Maybe that’s why she was now angry enough to swear at the people she was trying to convince. She’d gone to a lot of trouble, but no one was buying her act. She had been waving that sheet of paper under Dr. Kovaleski’s nose. Now she shoved it into her black leather clutch purse, whirled and marched out of the office, pushing past me without a glance. Her high heels stacattoed the linoleum as she headed for the stairwell. I followed her. Outside Mieklejohn Hall, she plowed a path through crowds of students like a battleship at full steam, moving up the hillside steps toward the campus bookstore. Before reaching the store she turned right and crossed the street to a parking lot where a white Thunderbird with California plates straddled the line between two spaces. She unlocked the door, hurled the purse onto the passenger seat, and slid in behind the wheel. The engine roared and she backed the car out with a jerk, narrowly missing a couple of students. One of them yelled something at her. She responded with the raised middle digit of her left hand and gunned the engine. The Thunderbird squealed down a row of cars and exited the parking lot at an entrance. I wrote down the Thunderbird’s license number, then retraced my steps to Meiklejohn Hall. When I got back upstairs Dr. Kovaleski was seated at her desk, a frown on her face and her fingers beating a tattoo on her desk blotter. My father, Dr. Timothy Howard, occupied one of the two chairs opposite her. “What do you think, Jeri?” Dad asked, crossing one long leg over the other. “Tell me again how all this started,” I said, taking the other chair. Dad had given me bare bones on the phone last night, but I wanted to add some flesh to the skeleton. “Indeed.” Isabel Kovaleski’s voice was as dry as the sun-tindered grass on the hills surrounding the campus.